What precisely is the state of the African continent today? Depending on one's perspective, the answer may either dwell on Africa's recent economic and political accomplishments or focus on the long-standing single-story of failure, disaster and eternal dictatorships. 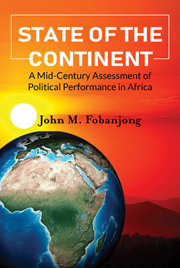 This book provides a nuanced, forceful and balanced assessment of Africa's political and economic performance since independence. While acknowledging Africa's tragic pitfalls, dating to the transatlantic slave trade and colonialism, State of the Continent skillfully argues that theories associated with the dependency school are no longer enough to explain the continent's failures in governance and economic performance. For a continent so richly blessed and endowed with both human and material resources, the blame for Africa's lackluster performance falls squarely on its leadership. To get things right, Nkrumah's vision of the primacy of the ?political kingdom? must be prioritized whereupon economic gains shall predictably, follow. In lucid and persuasive prose, this volume is an ideal book for scholars as well as students of international studies and African politics.